The neutral color trend dominated all of 2017, yet surprisingly with the new year came a new trend. The predictions are in, and it’s out with the blues, greys, and whites that were favored last year and time to make room for red, yellows and greens of today. 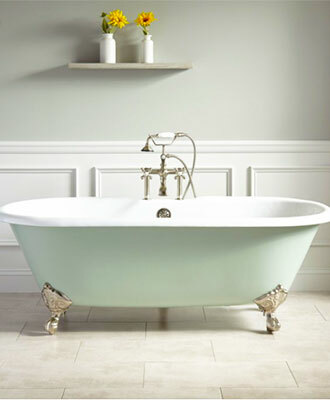 Sage green, in particular, has been gaining a lot of attention and for all the right reasons. 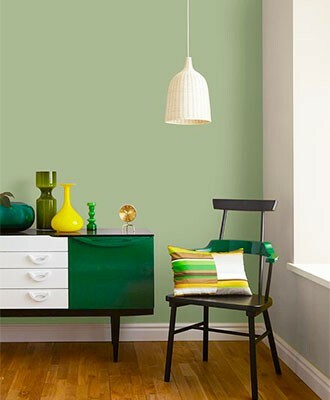 This gentle green hue is an excellent alternative to more traditional neutrals. Sage green is just as versatile as traditional neutrals like gray and blue, pleasantly complimenting various decorating styles, accent colors, natural materials, and metals. Follow on for our senior designers five ideas for decorating with sage green paint and learn how to incorporate this trending color in your home decor. When it comes to bedrooms, they should be comfortable, tranquil and relaxing. That is why designers everywhere choose to decorate bedrooms in muted neutral colors. Sage’s soft grayish-green hue is quickly becoming in on-trend replacement for traditional neutrals like blue and gray. 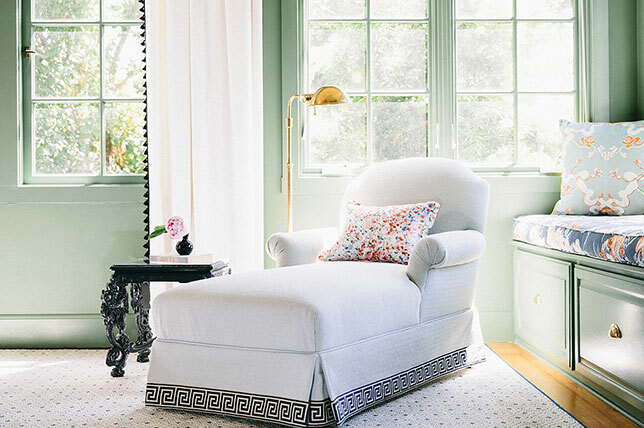 Sage green paint on your bedroom walls will promptly provide a soothing atmosphere, and the color has been known to be a mood enhancer as well. If you’ve decided to try out this new favorite color, our designers suggest contrasting it with warm to the touch decor, such as sheepskin rugs, knit throw blankets, and other textured decor pieces. Sage green unlike other trending colors, such as tonal reds and burnt yellows, is a muted shade that won’t overpower other decor pieces in a room. 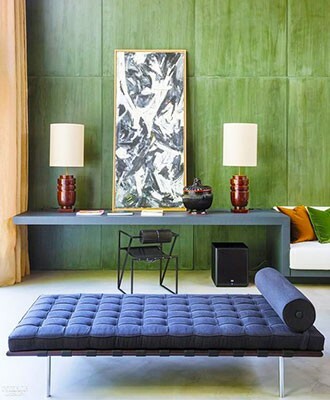 Many galleries use white as the backdrop of their art pieces, yet the subdued tone of sage green paint will allow the art to become the focal point of a room, while the pigmentation assists in bringing out colors around it. In other words, decorating with sage green helps create an eye-catching pop of color, that might otherwise not happen with another neutral like gray or ivory. If you are looking to try out the new trends, start sourcing decor in daring, bold shades, but don’t forget to incorporate pastels and more importantly sage green. In a room full of deep golds, burnt oranges, and mahogany, sage green decor accents can help tone down a home’s space and counter the overwhelming feeling that accompanies more vibrant colors. Sage accents such as statement pillows, table trays, and rugs. Sage green decor will work well in modern areas, helping to create a warm and inviting atmosphere for yourself and your guest, despite the room’s other contemporary, sleek and stainless steel decor. 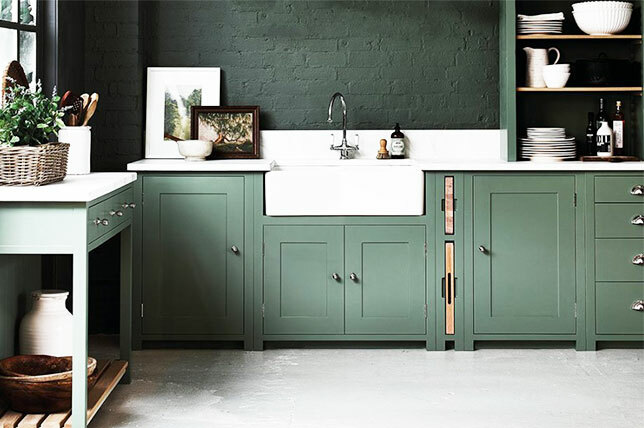 Incorporating sage green decor into your space opens multiple possibilities, and while looking for areas in your home to try out this trending color do not skip over your bathroom. Due to its soothing, tranquil nature, sage green can help create a serene experience, transforming your washroom into a lavish in-home spa. Painting the walls aren’t the only way to introduce sage into your washroom, from tiles to accents rugs, and even better, sage is likely to complement the colors currently in your bathroom space. Before 2018 started, most designers were predicting the end to the classic, traditional all-white kitchen. So say goodbye to stark white and hello to sage green. Decorating with sage green is excellent for those looking to make a subtle change. A great place to start adding color to your previously white kitchen is with the cabinetry. The earthy, leafy color will look great with preexisting hues and materials already found in your space. A soft shade of sage will subtly compliment various wood tones. Stainless steel and other mixed metals as well as stones like quartz and granite.